In their first matchup against Lipscomb Jan.29, the Flames were dominated 79-59 in a game marked by messy, seemingly immature play. The Flames hope to reverse that loss Wednesday evening with a victory over the Lipscomb Bisons. The Flames will compete Wednesday, Feb. 13, at 7:30 p.m. in Allen Arena, in Nashville. 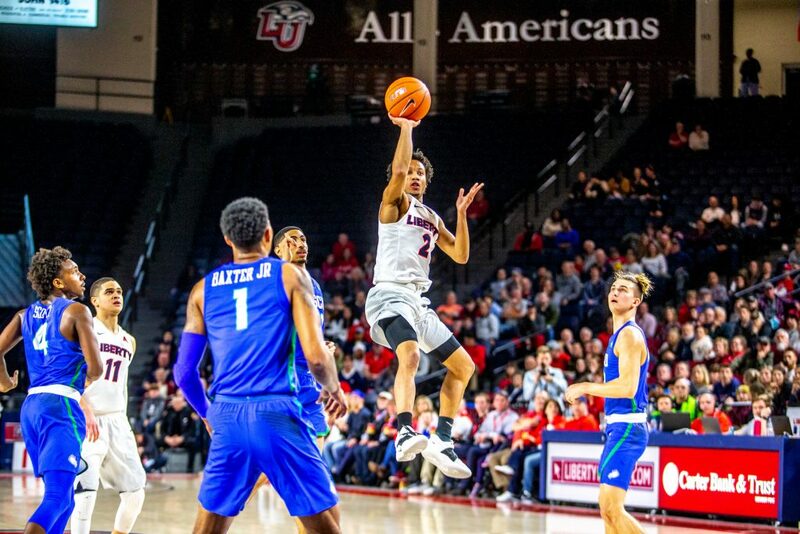 The Flames look to reclaim the top spot in the Atlantic Sun Conference, which they held until Lipscomb defeated them in their first matchup Tuesday, Jan. 29, in the Vines Center. Lipscomb currently dominates the first-place position in the ASUN with an 11-0 conference record and 20-4 overall record, which is supported by an 11-game win streak. The Bisons are also on a 19-0 conference win streak over the past two seasons and are boasting their third 20-win season in a row. A victory for the Flames would pull them to an 11-1 conference record, tying them with Lipscomb’s then 11-1 record, breaking their win streak. According to Flames Head Coach Ritchie McKay, the Bisons are one of the best teams he has seen in years. The Flames will have the odds stacked against them in their matchup Wednesday night. ESPN’s matchup predictor has listed the Bisons with a 75.4 percent chance of winning, while Liberty only holds a 24.6 percent chance at victory. The Flames have also been 0-3 against Lipscomb over the years, beginning with losses in 2005 and 2006 and most recently with the January 2019 loss. Despite Lipscomb’s skill and the less-than-ideal odds, McKay said he and the basketball team are going to play their hardest, win or lose. One of Liberty’s main challenges will be shutting down Lipscomb’s shooting game. A key player for the Bisons is senior guard Garrison Mathews, who averages 20 points per game. Liberty failed to slow down Mathews in their first matchup and allowed him to rack up 22 points, even with guards Elijah Cuffee and Lovell Cabbil covering him. Lipscomb also has senior forward Eli Pepper, who proved himself as a threat after coming down with eight rebounds and 11 points in their first matchup. The Bisons also managed to contain Liberty redshirt junior forward Scottie James to a measly five points and five rebounds. James typically averages 12 points per game and nine rebounds. Despite Liberty’s uncharacteristically messy and sub-par play in their first matchup, even with perfect play, the Flames will have to work hard to defeat the Bisons. According to McKay, their loss was partly his fault due to a lack of detail in practice and a lack of focus on the goal. As a result, the Flames shot a season-low 37 percent from the field and suffered their first conference loss of the season. Since then, Liberty has recovered some of its stats in three wins against NJIT, Stetson and Florida Gulf Coast University. 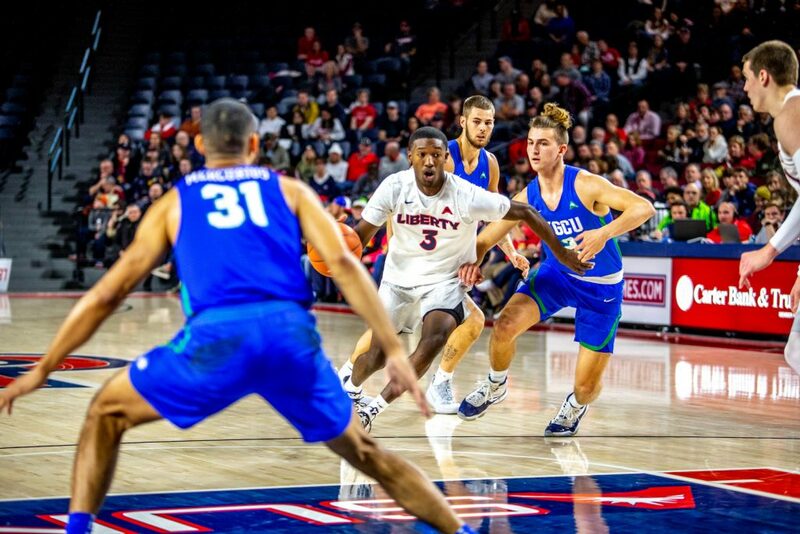 Though Liberty dominated NJIT handily, Liberty struggled to put out any kind of energy against Stetson and nearly went into overtime off of a missed Stetson 3-pointer. FGCU also proved to be a bit more of a challenge than the Flames would like, keeping within ten points of the Flames for much of their game. In the end, McKay hopes he and his team can put up their best effort and find success, whether they win or not. Baker is the sports editor.